GreenSun Energy LTD based in Har Hotzvim, Jerusalem has developed some prototype solar panels that will significantly reduce costs and also be capable of creating energy from candy-coloured solar panels that capture different parts of the sun’s light spectrum and don’t need direct sunlight to work. The jewel tones of the panels allow them to capture different parts of the sun’s light spectrum, conventional solar panels require direct sunlight to produce electricity. In contrast, the coloured panels don’t need to face the sun and can absorb dispersed light, allowing for energy collection on a cloudy day, albeit with less efficiency. The company says the coloured panels are less expensive than conventional solar panels because they require less silicon to manufacture. So how do they work? 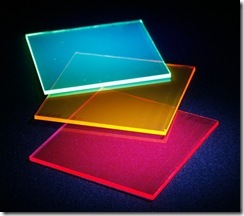 When light hits one of the coloured panels, it is diffused to the edges, which are covered with silicon solar receptors that, in turn, produce electricity. The company says the coloured panels are more practical because they can replace everyday building surfaces, such as windows and walls, rather than requiring a full roof or field panel array to be effective. Russ September 29th, 2009| 6 comments - be the next!|Tags: Solar. I have followed the development of portable, and affordable, solar panels with interest – even haute couture. There are good panels available from Brunton (who also have good guides to power usage); Sunware (27 watts); Sunsei (2,6 and 18Watts); and of course for small devices like mobile phones and true portability there is Power Monkey and Freeloader. As a matter of interest I have been using Power Monkey both in the car and on the boat since 2007 without a hitch. I see there are even more powerful – portable – offerings now on the market. Such as the PowerFilm F15 – which packs a tremendous 60watts. Russ September 25th, 2009| One comment so far - be the next!|Tags: Solar. If you have read my blog recently then you will also realise that the question of the rising cost of diesel fuel has also been causing a lot of concern and controversy in the UK boating community. So I thought I would carry out an investigation into the practicality of running a boat on pure electric or on hybrid propulsion systems such as combined diesel and electric power. Although there are drawbacks to hybrid systems – some of which I list below – it reminds me of the early days of the commercialisation of the microcomputers in the 80’s when every advance could be met with derision and scepticsm particularly by those that always think the glass is half empty. Having spent my working career in software development, I have an easy acceptance of rapid change; of innovations that cause step changes; of being periodically surprised by the ingenuity of physicists, chemists, and materials scientists that have created a tipping point so many times over the past 20 years. This is what will happen in boat building now. I believe that all the drawbacks that people cite will be overcome. Many are already within reach and lie within the bounds of the current technical horizons of boat design, alternative energy generation, electrical storage, and hybrid propulsion systems. Of course it is tempting to think that these are new ideas but in fact in 1912 Jack Delmar-Morgan created a motor yacht that was unique. His yacht Mansura was designed to run selectively under petrol, electric or sail power alone or under any combination of these sources. The petrol engine could be started electrically and the yacht was equipped with electric lighting, cooking and water heating systems. The hybrid power train delivered 9 knots under petrol power, between 5 and 8 knots under electric power and 11 knots under both but just as impressive was the silent running and ease of her operation and maneuverability. It was in memory of him that the Mansura Perpetual Challenge Trophy was launched earlier this year. The idea was to inspire an international competition, recognising innovation in the design, development and operation of marine vessels with hybrid or all-electric propulsion systems. Hundreds of entries were received and of these 25 hybrid designs were followed up in Australia, Canada, France, the Netherlands, Switzerland, the United Kingdom and the USA as the competition gathered momentum and international recognition, leading to a final shortlist of five contestants from four nations. This year the Mansura Trophy was awarded to Lagrange Construction Navale de Bordeaux for their Lagoon 420 . All Lagoon 420s will have the new propulsion system as standard – the diesel only version is an option! The propulsion system comprises two electric motors connected to propellers by straight shaft transmissions, one generator and two sets of 6 batteries. When batteries are 100 % charged, the boat will be able to function with both motors for approximately two hours (depending on speed). When batteries are 80% charged, the generator will automatically start and charge the batteries in order to provide electricity for the motors. When sailing, propellers will recharge the batteries. Built using Leroy Somer’s Motor Technology , the new motors offer strong savings in carbon dioxide emissions and engine maintenance. 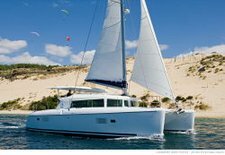 The Lagoon 420 is a full size cruising cat, there are a large number of smaller pleasure boats that combine solar, diesel, electric and of course sail to create a hybrid boat. There are even giant container vessels that use alternatives to just diesel power including the strange SkySail pictured here. Of course at the other end of the scale there is the Queen Mary 2 – Four 250 ton Rolls-Royce Mermaid™ electric propulsion pods totalling 80MW drive the QM2 along at almost 30 knots! Ok – its not that simple – The vessel is powered by four Wärtsilä diesel engines, supplemented by two gas turbines. With a total output of 118MW, the power plant develops 157,000hp. The actual propulsion is carried out by four 20MW Rolls Royce MerMaid podded propulsion units, two fixed and two azimuthing through 360Â°. They incorporate an electric AC motor that directly drives a fixed-pitch propeller with highly skewed blades for low noise and vibration. So how efficient are these systems ? Steyr Motors is now shipping their MO 256/H45 diesel-electric hybrid marine engine that couples a 250hp Steyr diesel engine with a 48 volt 14hp electric motor. Steyr provides an example that demonstrates the advantages of the engine. They replaced the engines of an older pleasure boat – a 34ft cabin cruiser with twin diesel 225hp engines that cruised at 21 knots and burned 20 gallons per hour. The same boat with two of their new diesel-electric hybrids cruised at 25 knots and burned 12 gallons per hour. So, it’s faster and consumes much less fuel. Well I assume that the diesels replaced were of an old type and not as efficient as a modern unit – but still it makes you think. 1. Batteries are too heavy /take up too much space? Taking the Fastcat435 for example, it uses 11 normal sized 60Ah car batteries – but they can be distributed to advantageous positions in the boat, and depending on the whole system you may not have a conventional generator or other items of equipment. 2. The batteries would cost too much? Again the Fastcat 435 quote approx. US$1,850 each or US$21,000 for the set of 11 batteries with an anticpated 10 years of life. I dont think any system has been shown to be cheaper in year1. They probably cost 10% more over the cost of a new boat. Well, lead acid or GEL are no more risk in a hybrid than they are in a normal boat and thats not very much, but some hybrids are using the Lithium Ion batteries that were blamed for the fire on the cat Playstation some years ago. However the Lithium Ion Phosphate batteries will not catch fire and are used on the Airbus aircraft for that reason. 4. Bearings on electric motors wear out. The development of brushless direct current motors using neodymium magnets has reduced this type of wear. Russ October 1st, 2008| 7 comments - be the next!|Tags: Batteries - Energy - Fuel - Hybrid - Solar. 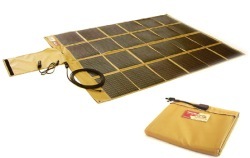 Just like the PowerMonkey that I reviewed and have used on my boat, for the past year, the FreeLoader is a power pack that can itself be charged using a solar panel. Freeloader is a portable charging system that can power any hand held device anywhere, anytime. Freeloader takes power from its solar panels, the supplied Supercharger or via its charge cable that plugs into a computers’ USB. Once charged, Freeloader’s internal battery can power an iPod for 18hours, a mobile phone for 44 hours, PSP for 2.5 hours or a PDA for 22 hours. I can verify the the Powermonkey works fine having used it since August 2007. But it looks like this company have a number of other products in the portable solar device market. 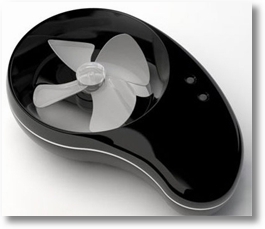 See the Solar Technology website – they even make solar toys like helicopters! Its good to see so many alternative energy products coming on to the market now. It will mean that they will get more and more powerful and efficient – and maybe one day all this product development will result in real hybrid or even totally solar powered boats. I will be posting on that subject soon. If your are wondering how to workout what size of solar panel to buy for a specific purpose on your boat there is a simple calculator and explanation on the Solar Technology web site. Russ September 14th, 2008| One comment so far - be the next!|Tags: Electronics - Energy - Solar.